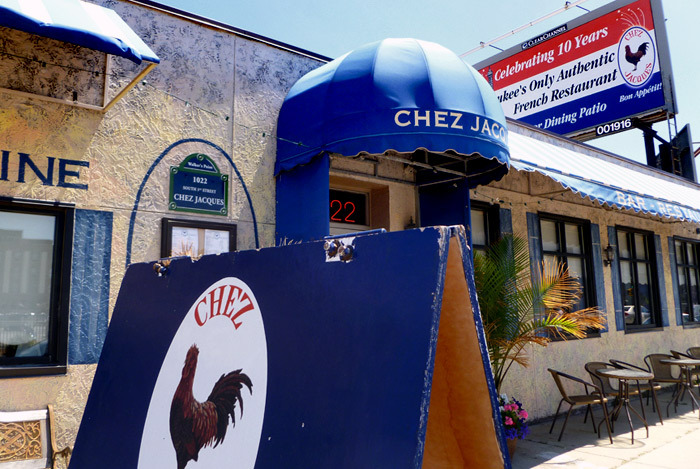 In November, a handful of details emerged regarding a new Mexican restaurant taking over the space of the former Chez Jacques (1022 S. 1st St.). Now, the wait is over and diners can visit Cocina 1022, which is officially open to the public. Owner Kevin Lopez has been working in the Milwaukee dining scene since he was 15, at restaurants such as Jalisco’s in Franklin, Fiesta Garibaldi, Habanero’s and Jose’s Blue Sombrero. Lopez, along with his mother Judith Figueroa, have recently become operators of the North Avenue Jalisco’s (2207 E. North Ave.). Tacos can be ordered a la carte with options like steak, al pastor, chorizo, lengua, calabaza, chicken tinga, shredded beef and cempechano featuring steak and chorizo with onions, bell peppers, cilantro and chipotle sauce (priced $2.50 – $3 each; an order of three includes one side). Taco plates are also available in options like chipotle shrimp ($12) and vegetable ($10), each of which includes a choice of sides. Guests will also find classic drinks like a signature margarita; a mojito made with Jamaica agua fresca; a vodka fizz with lime, ginger and rose water; and a unique riff on the old fashioned featuring rum, allspice and chocolate bitters… Signature cocktails are priced in the $7-$10 range. Cocina 1022 will begin offering a lunch buffet in the coming months, as well as a late night menu served from 11 p.m. to 4 a.m. Friday and Saturday. Current hours of operation are 11 a.m. to 11 p.m. Monday through Saturday. While Rosati’s Pizza had a relatively short stint on the East Side, it doesn’t seem the closure has dampened the national chain’s hopes for success in Milwaukee. The Chicago-style pizza purveyor will be opening another location at 145 W. Oklahoma Ave. in Bay View by April 9. Rosati’s East Side was located in the former Replay Sports Bar space (2238 N. Farwell Ave.) and closed last March. It’s reported that the menu at the Bay View location will differ somewhat from other locations; however, it is expected that it will offer both Chicago-style and thin crust pizza along with wings, pastas, sandwiches and desserts, with pricing averaging between $10 and $20. Rosati’s will be open 11 a.m. to 10 p.m. Sunday to Thursday, and 11 a.m. to 11 p.m. Friday and Saturday. The restaurant is currently hiring cooks and delivery drivers. A new Vietnamese Chinese place is coming to West Allis. Pho Saigon will occupy the former space of Sammy’s Taste of Chicago at 10534 W. Greenfield Ave. Owner Tu Tan Nguyen plans to open the eatery in August, and is also applying for a beer and wine license. Once open, Pho Saigon will serve lunch and dinner daily. In December, it was announced that Grassroots Salad Company would be taking over the old Capriotti’s space (111 E. Wisconsin Ave.) in the Chase Tower. The fast-casual restaurant now has an opening date, and will begin serving its salads, wraps and freshly squeezed juices on April 30. The company is owned by Peter and Louie Liapis, who also own the Georgie Porgie Burgers and Custard locations in Oak Creek and Mount Pleasant. The Grassroots menu features five core offerings: Caesar, Cobb, Santa Fe, Asian (pictured above as a wrap), and Kriti, a Greek-style salad with Kalamata olives, grape tomatoes, red onions, chickpeas, Wisconsin feta cheese and Greek goddess dressing. Guests can also build-their-own salads from a selection of fresh and housemade ingredients. Grassroots’ tentative hours are 8 a.m. to 4 p.m. Monday through Friday, and 10 a.m. to 2 p.m. on Saturday. The Wisconsin Ave location will be the restaurant’s second location, its first being a kiosk in Brookfield Square. Stand Eat Drink hospitality group has decided the pop-up genre of restaurants needs a new twist. The hospitality group has launched Cluck N’ Que, a delivery-only pop-up which, as the name suggests, will offer homemade fried chicken exclusively through UberEats. The menu…features two-, four- and 16-piece portions of buttermilk-battered fried chicken served up with sides of coleslaw and a pickle ($9/$15/$36) and Carolina-style BBQ Pork sandwiches for just $9, also served with coleslaw and a pickle. Add a slice of good old fashioned southern chess pie for just $6 more. Cluck N’ Que offers delivery of its fare through the app from 5 p.m. to 10 p.m. Sunday through Friday, and 10 a.m. to 2 p.m. Saturday. A new bakery slated for Wauwatosa will specialize in healthy treats. Owner Lula Allen hopes to open The Appleseed Bakery at 418 N. Mayfair Rd. in May. The bakery will serve up baked goods that are both GMO-free and made from scratch. Allen embarks on her new business venture following 25-year career as a Milwaukee Public School teacher. If the business request for a permit is approved by the Wauwatosa plan commission, the bakery will be open 7 a.m. to 6 p.m. Monday through Saturday, and 7 a.m. to 2 p.m. Sunday. A Mason Street Grill alum has been named executive chef for the new Milwaukee Bucks arena. Chef Kenneth Hardiman will collaborate with Levy Restaurants, which will provide food and beverages at the arena. Hardiman will work with the Chicago-based restaurant group to provide a varied fare that will also include items from local restaurants and vendors. The chef also has 10 years experience in the industry under his belt, having worked at restaurants across the country. Two major personnel changes are in store for Rare Steakhouse (833 E. Michigan St.). The first is the departure of Jack Sosnowski, a partner and “the public face” of the restaurant. Sosnowski has four Madison-area restaurants as well, and has sold his share in the Milwaukee location in order to spend more time with his family. The restaurant has also hired Joshua Wolter as assistant general manager. Wolter is currently the general manager of c.1880 (1100 S. 1st St.), and will be working at both restaurants until c.1880 closes at the end of this month. Aaron Schmude, a chef with experience in Las Vegas and D.C., has also been brought on as Rare’s new executive chef. “If I had to describe my style, it’s taking familiar, approachable dishes and then putting a little modern twist with different flavor profiles and complimentary ingredients,” Schmude said in a written statement. Rare Steakhouse is also serving a new lunch menu and will no longer be open on Sundays. The restaurant also has locations in Madison and Washington D.C. So Mr. Lopez of Cocina 1022 has worked at “Jalisco’s in Franklin, Fiesta Garibaldi, Habanero’s and Jose’s Blue Sombrero” … and hasn’t noticed that all of those places serve the Exact. Same. Food? And now he will too. Which is also the same stuff I could go five minutes up KK/Howard Avenue and also get at Guanajuatos, Cafe Corazon, Restaurante La Salsa for. Or five minutes into Walkers Point and eat at Botanas and Cielito Lindo’s? I had such hopes that this place would go beyond the same-old same old taco-burrito-fajita, plop of beans plop of rice set up. Sorry to criticize a place before they’ve barely opened but it doesn’t sound like anything we don’t already have a ton of in this area. I really enjoy the information you provide on new eating places. Milwaukee has a lot to be proud of! keep up the great and interesting work.